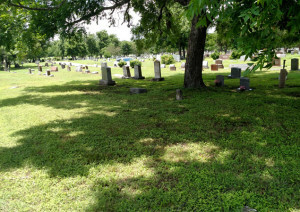 The Oakwood Cemetery Annex in Austin, Texas, is the last resting place of one of The Legal Genealogist‘s great granduncles. And it wasn’t a place I was entirely sure I ever wanted to see. But yesterday I spent some time there, thanks to Inez Eppright, a member of the Austin Genealogical Society. This great granduncle’s full name was John Elijah Robertson, and he was born in Mississippi in February 1850, the second son and second child of my second great grandparents, Gustavus and Isabella (Gentry) Robertson. So… why was I not sure I wanted to see where John was buried? Because John spent all of those last years of his life — the years he was not with his family — living in what came to be known as the Texas State Hospital but was then called the Texas State Lunatic Asylum. Think about it. And do the math. John spent nearly four decades as a patient — an inmate — at that asylum. When Inez picked me up yesterday morning, to change hotels from the one where I had stayed as a speaker for the Austin Genealogical Society seminar this past weekend to the one where I’ll stay to do some family research, I asked her if she thought we might be able to find anything about John’s burial at Oakwood. She was able to guide me, first, to information on the website of the Austin Genealogical Society, identifying John’s exact gravesite — section C, row 21, plot 5, of the Oakwood Cemetery Annex. Unmarked, yes, but according to that information it didn’t sound like it was a mass grave. Then she drove me to the cemetery where we found that location on the cemetery map. And then she drove me right to that part of the cemetery… which wasn’t a mass pauper’s grave area at all. I don’t know whether John’s family made special arrangements. I don’t know if perhaps things were just different in 1924. But — as you can see in the image above (click on it to see it larger) — where John is buried is a quiet, lovely, peaceful corner of this very old, very stately cemetery in Austin. Thank you, Inez, for the guided tour. Thank you, Austin Genealogical Society, for the work to make data about the burials of so many members of so many families accessible. And thank you, Austin, for having this quiet, lovely, peaceful corner in which my so very troubled great granduncle can rest. Three of my relatives are buried at Oakwood Cemetery — my 2nd great-grand-uncle John F. Pirtle (indexed as Purtle), buried 7 Aug 1869; his wife Lucy Rebecca Davis Pirtle, died 19 Dec 1870 and their youngest son Felix, died 31 Jul 1922. Probably all three are in unmarked graves, and Felix may very well have been buried in that mass grave since he doesn’t appear in the cemetery database. In 1900, Felix was living in his older brother’s household, but both 1910 and 1920 show him as an inmate in the Texas State Lunatic Asylum. His death certificate says he was buried in Oakwood. I contacted the cemetery to see about getting copies of any records they have, but was told they are too fragile to copy. Thanks so much, Judy, for finding and posting this information! I have done a lot of looking but was unable to find anything more on Uncle John. I have also done a lot of looking re a state lunatic asylum situation (probably the same one) for the wife and children of an uncle on my mother’s side. I decided that Texas simply wasn’t going to release any information. On a site about the “state hospital” it said, “Don’t even ask.” I’m so glad that you were able to do boots on the ground research and find this “missing” uncle! Similar experience for me, moving to another hotel. I attended a national conference there some years back and the room without someone sharing it was too expensive for my budget after the conference. I stayed a bit longer to have a reunion with my Texas half-siblings. The taxi driver didn’t want to leave me at the motel I chose! I stayed but noticed a lot of police cars coming and going that night! LOL Hope you chose better! There is a very active group that cares for the cemetery. They restore and photograph markers. I’m sure they would assist you if you were to place a marker on his grave.